New York Yankee fans will get a taste of the American Saddlebred world when the YES Network (Yankee Entertainment Specialists) airs an episode of their Kids On Deck program this summer. Former All Star and Golden Glove winner Don Mattingly, now the Yankees hitting coach, and retired catcher Joe Giradi took time out from training camp to visit Pam Rousch's Avalon Riding Academy in Lutz, Fla., in late February. The purpose: to film a segment Giradi called Riding 101. For the catcher turned bench coach, it was a first. Mattingly, his co-host on the television series, enjoyed doing something that is a big part of his and his family's lives. Horse show fans will remember Mattingly more as the husband of Kim Mattingly, who showed Glendale's Radiant Princess, successfully in the mid-to-late 1990s and as Taylor Mattingly's father. Taylor campaigned CH The Butler Eagle, riding with his mother under the DeLovely banner. During the off-season and after retirement, Don Mattingly became as involved in Diamond 5 Farms as the rest of his family. He was known to slosh through rain and snow to feed or dig stalls, but had little experience in the saddle. Taylor, drafted by the Yankees right out of high school, played one year with the team's Gulf Coast farm club, then missed the 2004 season for shoulder surgery. He is back in training camp, playing his dad's former first-base position. While Taylor no longer shows, and Don is away from the farm, Kim and the couple's youngest son, Jordan, will be campaigning this season. Coached by Helen and Jimmy Robertson, Jordan made his show ring debut with Daydream Dancer in the 13 and Under Roadster Pony division. 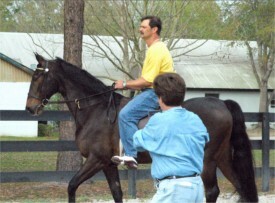 He also rides Oh My's Living Legend, a colt out of Kim's first three-gaited horse Oh My! B.S. and by Harlem Globetrotter in the junior exhibitor show pleasure division. Kim will make her debut on Cadillac Spirit in adult show pleasure classes. With four broodmares at home and youngsters on the ground, Kim keeps busy. They have a junior horse, Odyssey Mann, by Desert's Supreme Memories and out of CH Glendale's Radiant Princess, in training with Rob Byers. Kim predicted the junior horse would probably show in the three-gaited division. The Robertsons have another Princess youngster, by CH I'm A New Yorker, Namaste, in training with an eye toward five-gaited competition.